Jesus Christ is God. Although He has two natures, divine and human, as taught by the Catholic Faith, there is only one Person, Who is divine. He is, therefore, worthy of all worship both in His holy humanity and His divinity. And His most holy Humanity is worthy of veneration, not only in its whole, but also in each part. Thus the Body and Soul of Christ can and should be venerated, but the devotion can be separated. Each of the Sacred Members of His Body can be paid reverence in a special devotion. The cult of Christ's adorable Wounds in His Hands, Feet and Side is very ancient in the Church. 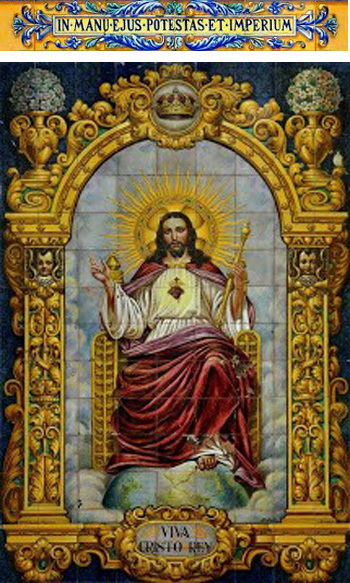 Also common is the veneration of His most pure Blood; likewise, His Sacred Head, crowned with thorns, etc., This serves to respond to those who ask with astonishment: Why do we have this special devotion to the Sacred Heart of Jesus? The definitive answer: First, veneration can be paid to any part of His holy humanity. But there is a very special reason for this cult of the Heart rather than His Head, Hands or Feet. The heart is, of all the body organs, the most important. The heart is to the emotional part of our being what the brain is to its intellectual part: It refers to the most intimate and mysterious contact with the soul through the life of sentiment. It is like the forge it uses to prepare the affections. Thus, just as in all languages thinking is associated with a man's head, so also in all languages a man is said to love, hate, suffer, rejoice, yearn for and fear with the heart. It is by its intellectual operations that the mind better serves the soul; but its affective operations use the heart. Therefore, in the human ensemble the heart has a particular importance. Besides being the regulatory valve of man's circulatory system, it is the sanctuary of his most delicate feelings; it is the volcano of his most blazing flares; it is the hidden spring of most of his actions and inclinations. It has rightly been said that a man is worthy what his heart is worthy. If he rises to the sublimity of an Angel or sinks to the horrible condition of a devil, this commonly happens to the degree he has purified and exalted the sentiments or feelings of his heart or, to the contrary, has corrupted and degraded them. Now then, Jesus Christ, true God and true man, had in His mortal life – and has now in His glorious life in Heaven and hidden in the Blessed Sacrament, a real Heart. And as His Divine Person is rightly the person of a God-Man and Man-God, His Heart is both a human Heart and a divine Heart. A Heart that belongs to the Man and the Heart that belongs to God: a Heart that beats and stimulates all the noblest human sentiments, together with the noblest affections of the Divinity. Christ loved God the Father and human creatures with an infinite love; the organ or forge for His infinite love was his Divine Heart. He hated sin, which is the only thing deserving of the hatred of God; the center of this infinite hatred was His Divine Heart. He longed for divine glory and human redemption with so great a hunger and thirst that it made Him impatient for the torments and death He would suffer. The focus of these yearnings and divine impatience was His Sacred Heart. We can discuss, therefore, whether worship and veneration is owed to the Cross on which the Savior died, the nails that pierced His Hands and Feet, the thorns that pounded into His Head, the tomb into which His Body was placed because of the physical contact that all these objects had with his Divine Person. Then, is there not more reason to honor with a very special devotion and love His Heart if one considers it as the most noble part of His Sacred Humanity, as the most delicate essence of His most holy essence, as the finest organ with which His blessed soul loved us and wanted to suffer and die for us? 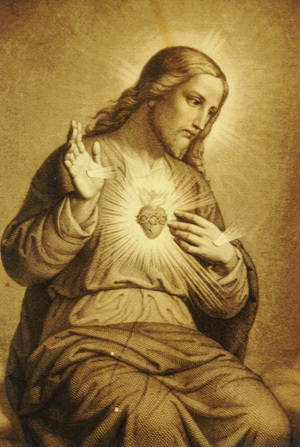 Therefore, considering the Sacred Heart as the material object of this beautiful devotion, we would already have an incontestable right to honor it from this aspect alone. But the devotion to the Sacred Heart is not just to honor the material tissue of that human organ of our Divine Savior; we also venerate His Heart as a symbol of His immense love for men, which led Him to die for us on the tree of the Cross. This is the second aspect of the question, no less interesting than the first. It is also commonly understood that the heart is the most appropriate symbol of love. The language of every people expresses it thus. When we say that a person is master of our heart, or that he reigns in our heart, or we ask him to let us enter his heart, this is only to signify that we love him, or desire his love for us. By heart we understand love. Yes, there is no more accurate representation of the divine affection of the Savior than His Heart aflame to signify the burning fire of His love; His wounded Heart pouring blood to His love over all mortals; His Heart encircled with the cross and crown of thorns to remind us of the agony and suffering that this love caused Him. It is a symbol that in itself is a poem; a symbol that speaks more eloquently than the most vehement phrases of a speech; a symbol can be understood by anyone who has the eyes to see and a heart to feel. This symbol is so perfect and fitting that it could have been chosen by men to best represent the infinite love that our sweet Jesus has for us; but it was not chosen or invented by men. It was given and communicated to us from Heaven by the same lovable Redeemer. It has, therefore, in addition to its theological foundation and its precise philosophical foundation, the most respectable character of all, its celestial origin. Yes, the devotion to the Sacred Heart of Jesus, in its material terms as well as its symbolic aspect, was known since the early centuries of the Church and practiced by many Saints and souls enamored by God. But it was more specifically given to the world by Christ in the last third of the 17th century through the mediation of Blessed Margaret Mary Alacoque (1647-1690), a Visitation nun, recently declared Blessed by Pius IX. [St. Margaret Mary was canonized by Pope Benedict XV in 1920]. The revelations made by Jesus Christ to this faithful spouse for the further development of the cult of the Sacred Heart have all been recognized by the Holy Church, whose scrupulosity in this matter is imponderable. 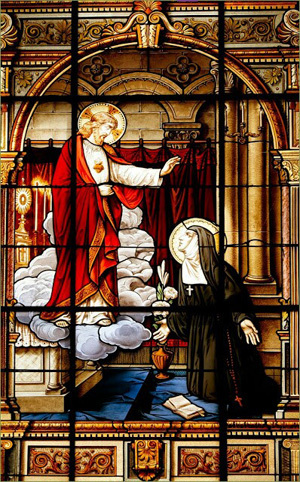 On repeated occasions, Jesus Christ appeared to Blessed Margaret showing her His Heart with the insignia of the cross, the crown of thorns and the spear wound, charging her, together with Father Claude de la Colombiere of the Society of Jesus, to propagate the devotion to the Sacred Heart throughout the Christian world. Further, they should ask the Church to install the celebration of its feast on the first Friday after the octave of Corpus Christi. He made singular promises to those who practice and spread this devotion, pointing to it as an effective remedy for the restoration of faith and a re-kindling of piety in the present times of lukewarmness and indifference. The exemplary religious fulfilled the charge, supported by Fr. de la Colombiere. After many inquiries and investigations conducted by the Holy See, after the tenacious and tireless war launched by Jansenism against this devotion, the cult to the Sacred Heart was officially sanctioned by the Apostolic Authority, the universal feast instituted and the prayer approved. And today the fervent contemplative of Paray-le-Monia, the faithful apostle and propagandist of the Sacred Heart devotion, has been raised to the honor of the altars as Blessed. And today, thanks be to God, amid the horrors of modern persecution that Catholicism is suffering in every corner of the globe, the Sacred Heart of Jesus is the banner of all the good, the battle cry in all the Church's fights, the heavenly hope of success for the future. Then, let us love and honor the Sacred Heart! 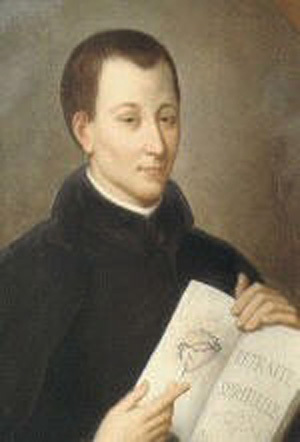 There is no book that can better teach us all the virtues; there is no teacher who has more divine authority to instruct us: His patience and abnegation in sacrifice, His celestial meekness on par with His incomparable firmness; His devouring and impetuous zeal coupled with the most benign, constant and loving charity. Let us love and honor the Sacred Heart! Sickened by the daily spectacle of hearts debased by the vilest of earthly aspirations, hearts for whom the possession of a handful of gold have made them as hard as this metal or hearts with a rotten, putrid and insatiable desire for sensuality. Sickened by the daily sight of seeing mired in the mud the hearts God created to be like birds in the purest region of the sky, not like reptiles with their faces turned toward the vile earth and its coarse emotions. Rise up, rise up with the Heart of Jesus! Rise up and follow his generous flight! Rise up with Him, emulating the loftiness of His thought, the sublimity of His vantage point, the perfection of His ideal, which is to make us great like His Father in Heaven! Rise up with the Heart of Jesus to another region, to a different air, to a nobler sphere! He Himself has said it and His devotees achieve it without exception: Let us rise up and follow this divine magnet, counterbalancing in ourselves the law of earthly gravity that constantly drags us down to the bestial! Let us live with Him for Heaven, which is our true spiritual center of gravity! Let us love and honor the Sacred Heart! It is the heart of our Father, our Brother, our Friend, our King, our God! Let us rejoice in reanimating ourselves by reposing and restoring ourselves in It in Holy Communion! Let us rejoice in confiding to It our most hidden sorrows and our most poignant anguishes! He gives Himself without reservation to those who love Him; He yearns to surrender himself to those who seek Him. Hearts thirsting for comfort and love, instead of relying on the foolish and mad lies of miserable creatures, go and knock at the door of this Divine Heart! Let us love and honor the Sacred Heart! The Church is His home, the tabernacle His chamber for intimate confidences. No one seeks Him there in vain. No one fails to find peace, love and comfort there. All the Saints know this; the great number of sinners know this. Yes, sinners also, they are welcomed there, and heard and embraced. The Divine Heart concedes to the righteous perseverance in their love, and to the repentant the grace of forgiveness and the most tender kiss of reconciliation. Yes, love and honor the Sacred Heart!